This very large floral pattern fabric was spun from Irish grown flax and woven into "fine Irish Linen." 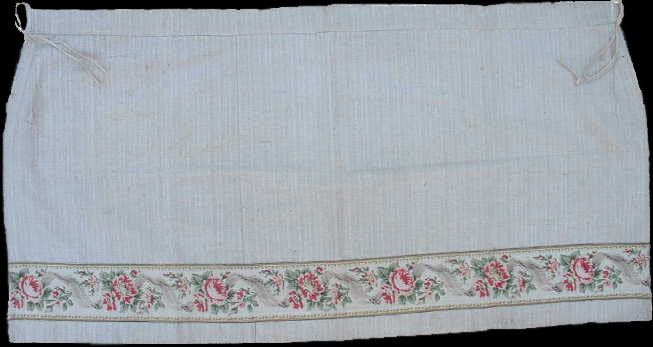 According to the Titanic International Society Inc. "this fabric was used in the Titanic's first-class staterooms, although it does not mean that was not or could not have been used in the second-class staterooms as well." Matching fabric may have been used as bed covers. This particular piece and others that accompany it, was purchased as a second set to be used for as a change when the Titanic returned home. After the sinking, White Star Line quickly auctioned off these and other items in Belfast to minimize superstition and negative press. These were from an elderly woman whose mother originally bought the fabric. She tells the story of how, as a young girl, she witness the building of the Titanic and how her parents and brother were invited to the launching by the Lord Mayor of Belfast. She explains that some cabins were fitted out with "pure Irish linen curtains and bedspreads, with fruit and flower borders." Small pieces of this pattern are included in some advanced collections and can be seen on a couple very popular Titanic websites. A close-up of one portion of the floral print fabric. This part measures about 3" x 5 1/2". A close-up of the adjoining floral print. As you can see in the large floral print fabric page, these designs alternate at the bottom of the curtain. The prints are sewn directly on top of the curtain, making the fabric thicker at that end.